SRC’s new R&D centers; space R&D; vaporizing chips. The Semiconductor Research Corp. has launched a network of research centers within its recently-announced Joint University Microelectronics Program (JUMP). SRC officially launched the 5-year, $200 million program on Jan. 1. With various research centers, the mission of JUMP is to lay the groundwork that extends the viability of Moore’s Law through 2040. The idea is to create new architectures and systems in a range of fields, such as AI, chip technologies and self-driving cars. JUMP includes the following sponsors—Defense Advanced Research Projects Agency (DARPA), IBM, Northrop Grumman, Micron Technology, Intel, EMD Performance Materials, Analog Devices, Raytheon, TSMC, Lockheed Martin, ARM and Samsung. *The University of Notre Dame has announced the Applications and Systems-driven Center for Energy-Efficient integrated Nano Technologies (ASCENT) Center. The new $26 million research center will pursue four areas of technology, including three-dimensional integration of device technologies, spin-based device concepts, heterogeneous integration, and hardware accelerators for data intensive cognitive workloads. *The University of Michigan has announced the Center for Applications Driving Architectures (ADA). The new $32 million center will develop new ideas in computing frontiers, such as autonomous control, robotics and machine-learning. *The University of Virginia Engineering’s new Center for Research in Intelligent Storage and Processing in Memory, or CRISP, will look at ways to remove the separation between memories that store data and processors in systems. The center will obtain $27.5 million in funding to overcome the so-called memory wall in systems. *Researchers will collaborate in the new $27.5 million CONIX Research Center headquartered at Carnegie Mellon. CONIX will create the architecture for network computing that lies between edge devices and the cloud. *Purdue University will lead a new national center to develop brain-inspired computing for intelligent autonomous systems such as drones and personal robots capable of operating without human intervention. It will lead the Center for Brain-inspired Computing Enabling Autonomous Intelligence, or C-BRIC. It will receive $27 million in funding. *The University of California at Santa Barbara is the lead institution for a research center that will explore terahertz-range communications and sensing. With $27.5 million in funding, the effort is called the Center for Converged TeraHertz Communications and Sensing. PARC, a Xerox company, has announced a partnership with Blue Origin to conduct R&D in space. 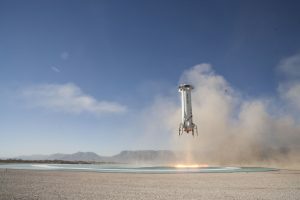 The partnership will leverage Blue Origin’s reusable suborbital rocket, dubbed New Shepard. Blue Origin is an aerospace manufacturer and spaceflight services company set up by Amazon.com founder Jeff Bezos. The goal is to conduct R&D experiments on one of Blue Origin’s upcoming suborbital flights. PARC and Blue Origin will develop space R&D technologies in four areas–advanced manufacturing, energy systems, human-machine interaction, and predictive analytics. Cornell University and Honeywell Aerospace have devised a new way for remotely vaporizing electronics into thin air. The goal is to develop self-destructing technologies in case they were to get into the wrong hands. The technology could also be integrated into wireless sensor nodes for use in environmental monitoring. The technology falls into the category of transient electronics. In this area, the key portions of a chip or the entire circuit can be automatically disintegrated or dissolved. There are a number of existing techniques in the field of transient electronics, but there are some challenges in the arena. Some transient electronics require the presence of moisture. Others need heat. Cornell has developed a new self-destructing technology using a silicon-dioxide chip, which is attached to a polycarbonate shell. The shell consists of tiny cavities filled with rubidium and sodium biflouride. These are chemicals that can thermally react and decompose a chip. A thermal reaction can be triggered remotely by using radio waves. The waves open the graphene-on-nitride valves, which keep the chemicals sealed in the cavities. “The stackable architecture lets us make small, vaporizable, LEGO-like blocks to make arbitrarily large vanishing electronics,” said Amit Lal, professor of electrical and computer engineering at Cornell, on the university’s Web site.